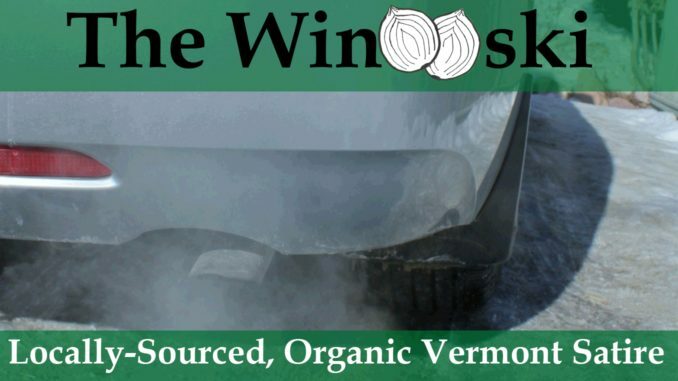 WINDSOR – Vermont has already seen a little snow, some frosts, and some chilly weather as November settles in, and one Windsor man is reading the signs and preparing for winter proper by starting his car to warm it up. Edward Starke has been getting some sideways glances from friends and neighbors who happen to see his idling car in the driveway, but he says he isn’t worried about public perception. State officials have warned Starke about the laws against vehicle idling, however Starke has so far avoided fines by citing the exception in the law for idling to ensure adequate windshield defrosting. Lawyers for the state are currently reviewing the definition of “adequate,” and may assess fines at a later date if it is found that Starkeis violating the law.